I want to come back to one of the hardest questions of Christianity and one that I think Mennonites have made important contributions to answering: How do we love our enemies? Can we (Is it even appropriate to be?) friends with people who espouse hateful beliefs and endorse hateful actions? They aren’t hateful. They’re loving. Westboro Baptists don’t see themselves as hateful. They see themselves as loving. Indeed, founding pastor Fred Phelps, who died a few years ago, saw himself not as a harasser of queer people but as a missionary to them. To be clear, his goal wasn’t their conversion, because Westboro’s unique hyper-Calvinist theology teaches that only God can convict a person. Instead, they preach to warn, and warning, they argue, is a form of love. It’s like this, one member explained to me: If you saw someone about to drive off a cliff, you’d warn them. You’d shout at them, “No! Stop!” Even if you knew it would upset them, you’d tell them. Even if it meant that they were angry at you, you would tell them. Indeed, if you allow your fear of their anger at you to dissuade you from speaking up—no, screaming out—you would be allowing your discomfort to take precedence over their safety. That is selfish. This is why the church carries signs that say “Love Thy Neighbor=Rebuke.” Because, as Jesus explains in the story of the Good Samaritan, everyone is our neighbor, we must love everyone. Loving them means correcting them (“rebuke”) when they are in danger. That might sound like an excuse for angry behavior, but I can tell you that almost every member of WBC I know truly feels this way. (There are singular exceptions who take I think do sadistic pleasure in their “rebuking” activities, and the church monitors these folks fairly carefully. Indeed, a criterion for joining is that your anti-gay actions can’t be motivated by personal homophobia, so someone who expresses too much personal disgust for gay people is flagged as a potential threat to the church.) In her memoir about their time in WBC, ex-member Libby Phelps say that there is no more sinister explanation: They were socialized into a subculture that teaches that hell is real, painful, and eternal. Nothing is worse than hell. They were taught that everyone outside the church is hell-bound—and likely some inside the church were too. Westboro Baptists preach that your only hope is that God has already elected you; their mission is to help you hear it, should God love you enough to open your ears. Doing this is an act of love for people socialized into this church. That often means getting loud (that is, offensive) as an act of love. When I look more broadly at the claims that hate groups make, I began to see that it is love, not hate, at the center of their claims. Now, I don’t mean to say that hate isn’t part of what they do or that, in many cases, hate actors proudly claim the title of “hater.” But, in many cases and especially in their engagement with the public they are trying to persuade, they use the word love, not hate. [W]e must first rid ourselves of the fear of being called “racists” and the other meaningless epithets they use against us. What is really meant by the [anti-racist] advocates when they peg us as “racists” is that we adhere to ethnocentrism, which is a natural affection for one’s own kind. This is both healthy and Biblical. I am not ashamed to say that I prefer my own kind and my own culture. Others can have theirs; I have mine. No group can survive for long if its members do not prefer their own over others. Hill calls for “a return to a political and social system based on kith and kin rather than an impersonal state wedded to the idea of the universal rights of man.” That is, we should love those socially near to us (“kith and kin” rather than those far (“universal”). We prefer the culture and abilities historically demonstrated by Christian White men over that of all other races. White advocates must insist on the legitimacy of European-Americans pursuing their group interests, just as every other group already pursues theirs. In making this claim, white supremacists appeal to things that many of us, in fact, agree are good: families, safety, respect for cultural differences. Don’t we all, they argue, have a right to our cultures? To our own space? To protecting our families? To ensuring the welfare of our children and their children? To pride in our histories? To liking our own appearances? You see the connection. These are not claims about hating people of color or immigrants or Muslims. They are claims about ensuring that our own white children and white culture (Whatever that is.) have space. That makes them sound innocent and even fair. In this view, even Jews will not replace us isn’t about anti-Semitism. It’s about preserving white (non-Jewish) space and making sure that white culture is celebrated for its role in world history. 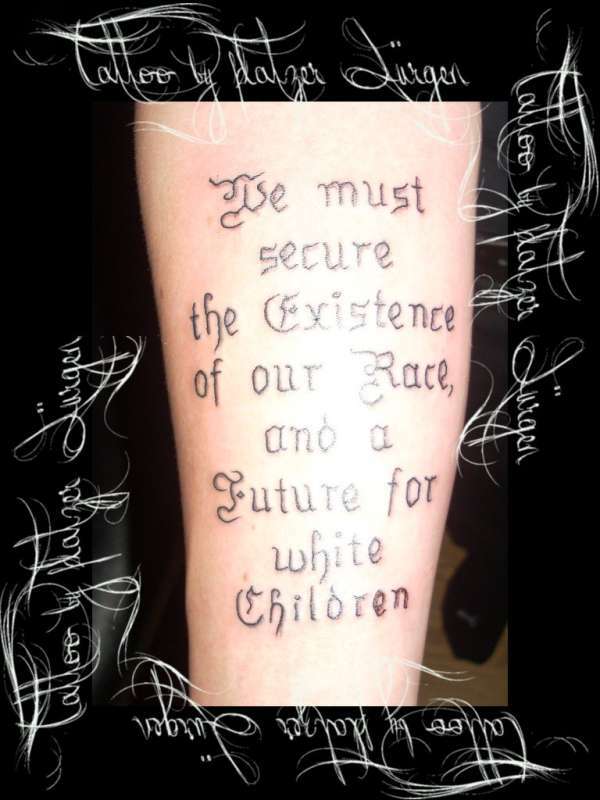 Above a 14 Words tattoo spells out the love that defenders of white supremacy say is at its core. The wide-eyed college recruit to the alt-right may even tell you that this isn’t hate but multiculturalism, about respecting differences by ensuring that they can be maintained. It’s about everyone finding their spot in the world. It’s about the separatism that is necessary to making that happen. This is why we are seeing Latinos joining the alt-right. It’s why we’re seeing white nationalism in Orthodox Jewish communities. It looks like love, not hate. Previous Previous post: If the life of a child isn’t a reason to stop mass violence, what might be?